Amla was a prolific run-scorer at the top of the order for KXIP. David Warner (c) - If there had been a vacancy for a synonym of consistency, the word 'Warner' would have been the first choice. The 30-year old captain of SunRisers Hyderabad ended the 10th season of IPL as the highest run-scorer with 641 runs under his belt. Maintaining an average of 58.27 and a strike rate of 141.81 for over 14 matches is no mean task. Warner continued his splendid run from IPL 2016 in terms of both batting and leading the side. Hashim Amla - Apart from scoring two centuries and two half-centuries in this IPL, Amla also broke the cliche regarding the inability of his style of batsmen in T20s. Amla was Kings XI Punjab's knight in the shining armour. A consistent force for them to rely upon at the top of the order. He scored 420 runs in 10 matches at an average of 60 and a strike rate of 145.83. Gautam Gambhir - The veteran Indian southpaw was the second-highest run-scorer in this IPL. His bat yielded 498 runs (three less than last season) in 16 matches at an average of 41.50 and a strike rate of 128.02. 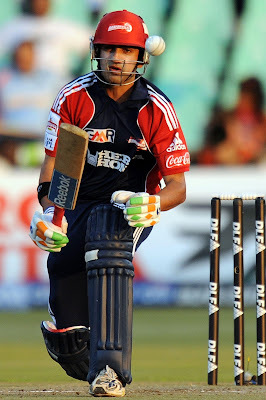 Gambhir adjusted himself into various batting positions according to what the team demanded from him, ranging from No. 1 to No. 4. His captaincy was as much praised as his batting. Constant supporter of offbeat field settings, he himself never shied away from standing at silly point or short-leg. Robin Uthappa (wk) - Gambhir's partner-in-crime, Uthappa, has also earned a place in the 'Top XI' of IPL 2017. The 31-year old wicket-keeper batsman scored the maximum number of half-centuries (5) in this IPL. In the 14 matches that he played, Uthappa aggregated 388 runs at an average of 29.84 and a whopping strike rate of 165.10. His strike rate is also the highest among the Top-10 run-scorers of IPL 10. Suresh Raina - He is the third IPL captain in the list of 'Top XI' of IPL 2017. Raina amassed 442 runs in 14 matches at an average of 40.18 and a strike rate of 143.97. Had his efforts been supported by some responsible bowling, the outcome of Gujarat Lions might have been different. He has been a stalwart in the IPL, scoring 4,540 runs in 161 matches at an average of 34.13 and a strike rate of 139.09. Ben Stokes - There was a lot of guesswork related to Stokes after the IPL auction. Well, his price tag was such. After the initial failures, Stokes went on to become the Most Valued Player of the season in his maiden season of the IPL. He also won the maximum Man of the Match (3) awards in this season. In the 12 matches that he played, Stokes scored 316 runs at an average of 31.60 and a strike rate of 142.98 including a game-changing century against Gujarat Lions. He also picked up 12 wickets at an economy rate of 7.18 and a strike rate of 22. Krunal Pandya - The second all-rounder in this playing eleven is the elder of the Pandya brothers. Krunal has made a name out of himself in only two IPL seasons. The 26-year old all-rounder from Baroda bowls slow left-arm orthodox and has it in him to bat anywhere in the middle order. He keeps the flow of runs on, irrespective of the situation. His innings of 47 runs earned him the Man of the Match award in the final. In 13 matches, Krunal scored 243 runs at an average of 34.71 and a strike rate of 135.75. His 10 wickets in the tournament came at an economy rate of 6.82 and a strike rate of 24. Bhuvneshwar Kumar - What Warner was for the SunRisers in batting, Bhuvneshwar was a replica in the bowling division. The 27-year old right-arm pacer bagged the Purple Cap for the second consecutive season in the IPL. His consistency has made him the leader of Hyderabad's bowling attack. In 14 matches, Bhuvneshwar affected 26 (three more than last season)) dismissals at an average of 14.19, economy rate of 7.05 and a strike rate of 12.07. Jaydev Unadkat - From playing a mere couple of games in the last two IPL seasons to finishing as the second-highest wicket-taker in this season, a lot has changed for Unadkat this year. The 25-year old left-arm pacer from Saurashtra impressed one and all with both his bowling and his fielding in this season. He was not even in the preferred playing eleven of Supergiant but ended the season with 24 wickets in 12 matches including a hat-trick. His dismissals came at an average of 13.41, an economy rate of 7.02 and a strike rate of 11.45. Jasprit Bumrah - Been termed as India's death overs specialist, Bumrah has made it difficult for batsmen to score off him. The super over which he bowled against Gujarat Lions was an exemplary to that. Bumrah has registered 20 scalps in 16 matches at an average of 22.20, an economy rate of 7.35 and a strike rate of 18.10. Imran Tahir - From not being picked in the auction to becoming an important cog in the wheel for Rising Pune Supergiant, Imran Tahir proved as to why he is the No. 1 bowler in the world. In 12 appearances for Pune, Tahir dismissed 18 batsmen. His victims were dismissed at an average of 20.50, an economy rate of 7.85 and a strike rate of 15.66. His 'celebratory run' was as interesting as watching him bowl.